Violin Case For My Tommy? Does anyone produce a violin case fitted for the Thompson? Some day when I have some $$$$$ to spend on neat accessories I would like to pick one up. To answer your question: yes and no. I assume you are familiar with the currently commercially available Kahr "guitar" case made for the longer bbl'd semi auto guns. Blah. There have also been some other custom cases made from wooden "coffin" style violin cases (maybe viola, I am no musician). I have attached an example below. These were nice because, unlike my case for my vertically gripped Thompson, you didn't have to remove the foregrip to make it fit. I have invested in several coffin cases, but none were big enough for this, so it is a crap shoot when you buy one (unless you can test the fit first, difficult if you're eBaying one...). I suggest your best bet it to fasion one yourself. With the proper sized case, it wouldn't cost much. Here's one on ebay. Looks like a custom job that would fit the full auto. That has been on Ebay for about 2 weeks, he lowered the starting bid price $20. My main problem with it is it appears with the lid closed that drum will really put some whack on the receiver. If the case is for other than display, I have also been advised by folks on this board that violin (or viola) cases are made for only a very few pounds, not the 20lbs. of a Tommy, drums and mags and one might find their TSMG scattered about thier feet at an in opportune moment, if there ever was one. So be careful and choose well. Oh, i could have some fun with this. I think I might throw the TSMG in a gym bag and go visit a music store that sell different violin/viola/whatever cases, and inquire about purchasing one, and then check the cases for proper gun fit. Maybe dress up in a pin strip suit or something with a fedora. Along a similar vein, it is fun to watch peoples reaction when they see me with my violin case and ask, "so, ya got a machine gun in there? 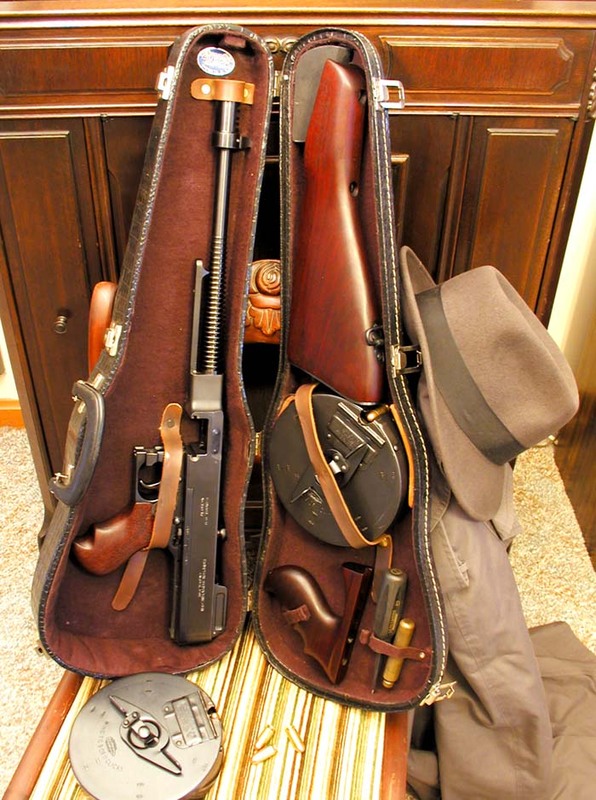 ", not expecting me to reply "Yup....."
Thanks for the interest in my violin tommy gun case. The straps in this case are heavy elastic and will hold the parts in very well on a real 1921 or 1928 and if you have a concern with parts banging together let me say that the case has plenty of room. And if you want to make darn sure we can make you a curtain from the same colored velvet that the case is covered in to go between the two halves. most of these for real thompsons and have had no complaints about being able to fit the genuine Thompsons properly. This is the last case I have of this type or style and do not know if I will have any more come in. This case is in good shape and should withstand the weight of the real thompson. It does have steel reinforcments around the body and lid. *Should* stand the weight of a real Thompson?? Thanks for all the info. It looks like I'll wind up making one for myself, as I have some pretty specific ideas on what I want. Having my 1928 hitting the floor with a loud clatter isn't one of them, so I will have to take the precaution of designing in some extra "beef". I tried an old hardshell violin (actually fiddle) case I had to see if my '28 would fit, and it wouldn't. The case was too narrow and short. I think most violin cases are actually viola cases, which are a little longer and wider. Problem is that most of the new cases are Courdoura covered or hard plastic as opposed to the old style coverings. I looked at a viola case at an antique shop yesterday. Yes, they are bigger, MUCH bigger and it completely blew the visual for me. At least the one I saw. Might as well use a banjo case! I carried my 1971 MGC replica Thompson in a gutted/adjusted violin case until I sold both together for about $325 this last spring. When I was shopping for the case in music stores in 1972, I carried a newspaper cutout of the replica for fitting. Didn't want to get anybody too excited carrying around an uncased "Thompson" in a metropolitan area. I still had to take the vertical foregrip and rear sight off. For the real 21a and 21ac, I just use a nylon case, for convenience of tools and knicknacks being right with it.